Heat 1 tablespoon olive oil in a medium saucepan over medium high heat. Add shrimp shells and cook, stirring frequently, until the tails turn pink, about 2 minutes. Add sherry and cook, stirring frequently, until most of sherry is evaporated. Add water and bay leaf, bring the mixture to a boil; reduce to a simmer. Let simmer, uncovered, 20 minutes. 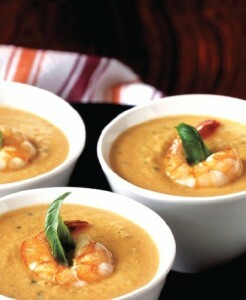 Pour shrimp stock through a strainer into a bowl and press gently on the shells to release extra liquid. Discard shells and bay leaf. While stock is cooking, heat 1 tablespoon olive oil in a large saucepan over medium heat. Add the shrimp and cook, stirring frequently, until cooked through (3-4 minutes). Move to a bowl and set aside. In the saucepan, add 1 tablespoon olive oil, carrots, celery and onion. Cook until the onion and celery are soft, about 5 minutes. Stir in shrimp stock, rice, tomato paste, cayenne pepper and salt. Cover the saucepan and simmer the mixture until the rice is tender, about 20 minutes. Reserve 4-8 shrimp for garnish and stir the remaining shrimp into the soup. Allow soup to cool 10 minutes. In a blender, puree the soup until smooth. Return soup to saucepan and stir in cream. Reheat on low. Serve in bowls and garnish with whole shrimp. Serves 4. Published on January 1, 2012 in Soups. In a large saucepan, cook mushrooms in broth with onion and thyme until tender (10-15 minutes). Reserve 2 cups cooked mushrooms for garnish and puree the rest of the mixture, leaving some chunks of vegetable in it. Set aside. In the saucepan, melt the butter, whisk in the flour until smooth. Add the salt, pepper, half and half and vegetable puree. Stirring constantly, bring soup to a boil and cook until thickened. Adjust seasonings to taste, and add sherry. Place in bowls and garnish with remaining cooked mushrooms. Serves 6. Willene J. Satcher – Satcher Insurance Services, Inc.